Getting started with lean in an existing organization is a challenge on many levels. Often some of the most important steps in a lean journey are not recognized. A common place people think they start is with 5S. It’s an excellent way to begin improvement practices and daily routines with quick results. Even when the organization starts with 5S, it isn’t realized that that the journey didn’t begin here. Understanding how the journey started is an important part of keeping the journey going. Changing the way an organization operates–changing the way people think and work–is no trivial matter. Getting from the old way of doing things to practicing5S alone is quite an accomplishment. 5S in any organization didn’t start with 5S. It started with leadership. 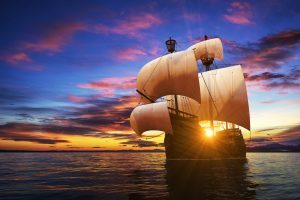 At some point, a leader made the decision to begin a lean journey–to point bow of the ship on a specific azimuth and set sail. Think of all of the commands given by the ships captain in any 18th century period sailing movie you might have seen. The captain barks out an order, usually to the first mate, to “Set course three six zero and set full sail.” The first mate would then give the order to steer the ship in the right direction to the coxswain who would then start spinning the wheel. He’d then give the order to set full sail to the boatswain’s mate. The boatswain’s mate would give the order to the boatswains, and so on. Getting the ship turned and underway, while appearing simple, was no easy feat. It took training, exercise, professional discipline, a shared purpose, and leadership to make this happen. Think of all of the things sailors are trained to do before crewing a ship begins. In the modern day work environment, we don’t work quite the same way 18th century sailors did. While the work environment is a bit more relaxed, many of the same organizational management elements exist. There’s a particular video of Paul Akers showing Two Second Lean at Fast Cap. Paul explains in the video that the speaks to each of his employees every day to see their two second improvement. While the focus is on the improvement made by each employee an important element is overlooked. Paul’s leadership routine is easily overlooked. It’s almost like an illusionist playing a card trick using misdirection. What’s really happening, while each employee is making small improvements every day, is that Paul continually demonstrates what is important to the organization. He verifies each person understands the direction. He immediately coaches and supports those who might be struggling with some aspect of their work by helping to bring the thinking back to the organization’s principles. He shows respect by speaking with them daily. He congratulates those who made and improvement and encourages those who have yet to bring their idea to fruition. The lean journey that starts with 5S actually starts well before anything gets sorted. Setting the direction, aligning leadership, teaching, checking progress, coaching, and encouraging people as a matter of routine is also happening before the ship really gets under way. It continues until the ship reaches its destination, which with any lean journey, is never.